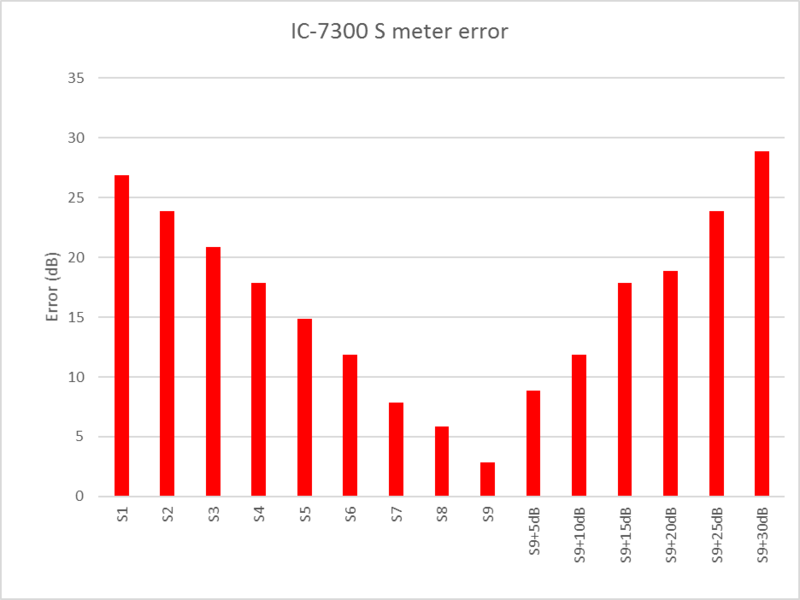 This article documents measurement of the calibration of an IC-7300 S-meter in SSB mode using a continuous sine wave at 1kHz tone frequency. There has been a long standing convention that S-meters are calibrated for 50μV in 50Ω to be S9, and S-points laid out at 6dB per S-point. IARU Region 1 formalised this with Technical Recommendation R.1 which defines S9 for the HF bands to be a receiver input power of -73 dBm (equivalent to 50μV in 50Ω). 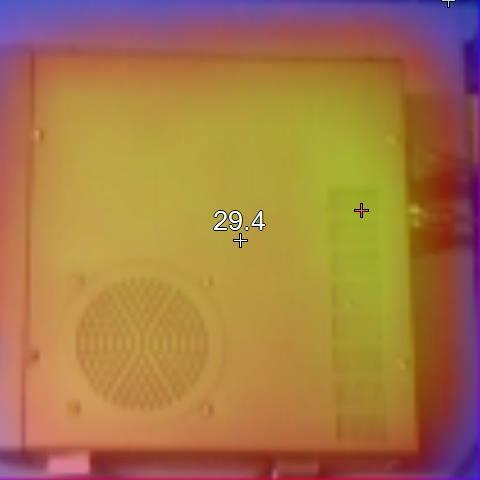 A test was conducted where a Standard Signal Generator was connected to the receiver and slowly increased from -125dBm in steps of 1dB and the point at which the S-meter display segments lit was noted. I have a Kenwood R5000 that is now 30+years old and warrants a check of its health. R5000s are infamous for VCO problems, the early production used ‘yella glue’ to stabilise the VCO components and that decomposed into corrosive components that damage the electronic parts. Repair is not usually economically rational. This is one of the later model R5000s that used the hard white adhesive which has remained stable. The R5000 is built on phenolic PCB and operates at relatively high temperature for a simple receiver, reflecting the power consumption of synthesisers of the 1980s. A correspondent has been tearing his hair out trying to replicate my VSWR plots of some STL. 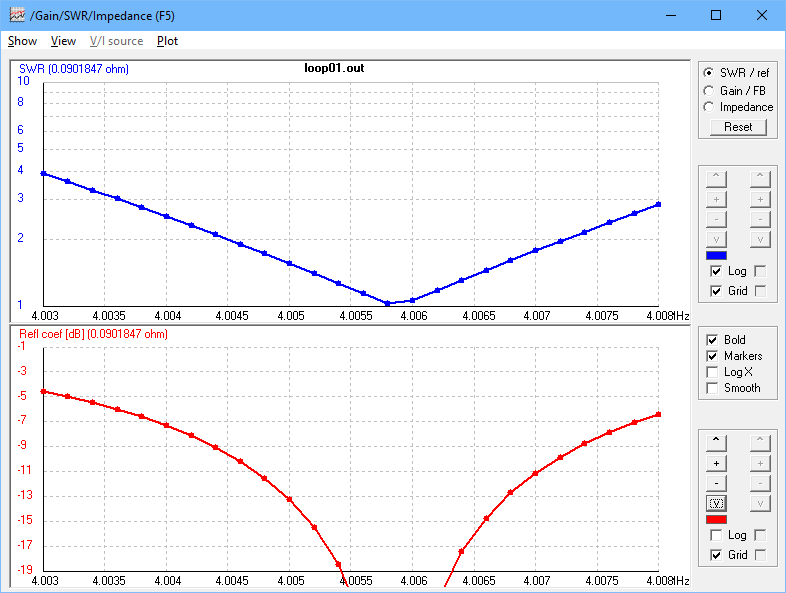 The ‘net abounds with calculators for design of small transmitting loops (STL), and most estimate the voltage impressed on the tuning capacitor. Most of these calculators give an incorrect estimate. 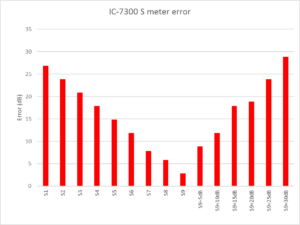 This article describes a measurement based approach to estimating the capacitor voltage for a STL. 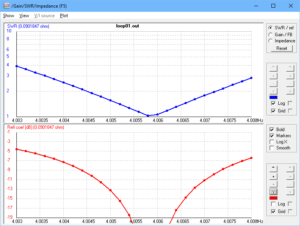 Precise RF have announced two small transmitting loops for amateur radio, this article looks at the Precise High Gain Loop. The antenna is described at (Precise RF 2017). 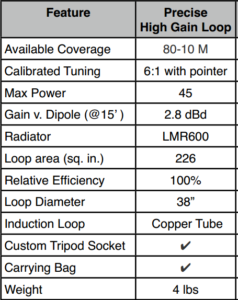 Above is an extract from a table in the brochure comparing the subject antenna to some others. On a quick scan, the standout figure is gain of 2.8dBd presumably at a loop height of 4.57m (15′), and without qualification of frequency. 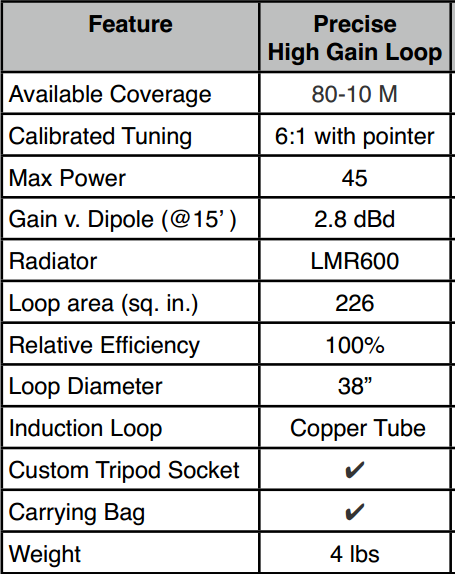 Elsewhere in the brochure there is a note that 80m requires an optional ‘resonator’… presumably a larger loop.